Researchers including Greg Rouse, a marine biologist at Scripps Institution of Oceanography at the University of California, San Diego, selected Scripps founding benefactor Ellen Browning Scripps as the namesake of a newly described millimeter-long marine worm found in La Jolla. 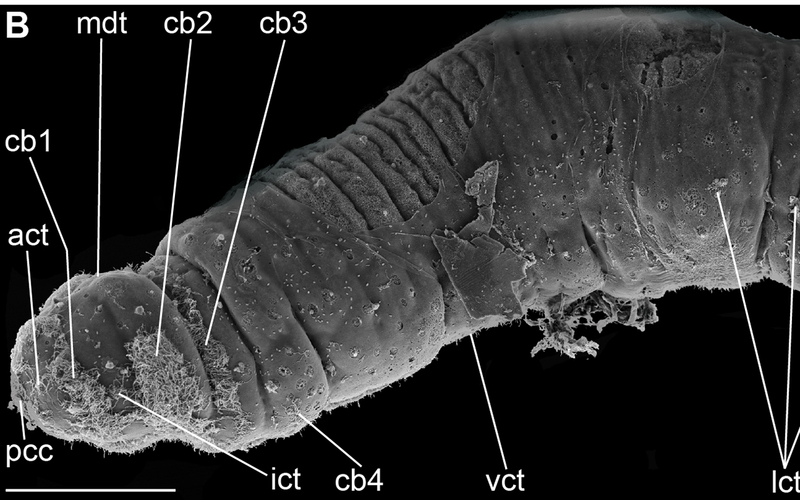 The team described the species Trilobodrilus ellenscrippsae in the European Journal of Taxonomy issue released April 3. Ellen Browning Scripps (1836-1932) played a major role in the emergence of San Diego as a prominent California city in part by spearheading the creation of the Marine Biological Association of San Diego, which evolved into Scripps Institution of Oceanography. With her backing, the association purchased the 170-acre plot of land that became the Scripps campus in 1907. Ellen Scripps provided funds for the construction of a road to the institution’s La Jolla campus and for construction of the original Scripps Pier, the successor to which bears her name today. Rouse said he got the idea to name the worm after Scripps after reading the 2017 biography “Ellen Browning Scripps: New Money and American Philanthropy” and proposed it to his co-authors who agreed on its appropriateness. To his knowledge, it is the first species named after her. “The main thing for me was that it was from La Jolla, off the Cove, which Ellen had a huge impact on with her community involvement and her philanthropy,” said Rouse. The research team was led by Alexandra Kerbl and Katrine Worsaae from the University of Copenhagen in Denmark. The researchers also named another worm T. windansea, that is named for the coastal neighborhood of San Diego in which the worm is found among beach sand grains. Both species are within the annelid family Dinophilidae and only 16 species have been described to date from marine sediments around the world. These two new species of Trilobodrilus represent only the fifth and sixth species to be named in this genus. The fact that they were both found in La Jolla suggests that there are likely to be many more dinophilids to be found worldwide, differing only in minute morphological details and their genetic sequences. Rouse has previously named species after prominent members of the Scripps community including geophysicist Walter Munk and biological oceanographer Lisa Levin as well as after internationally known figures such as the Dalai Lama. Since 2007, the institution has also offered supporters of the Scripps Oceanographic Collections an opportunity to name species.